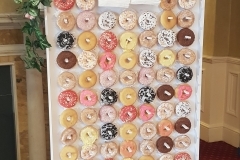 The new trend for 2019 is most certainly the Donut Wall. 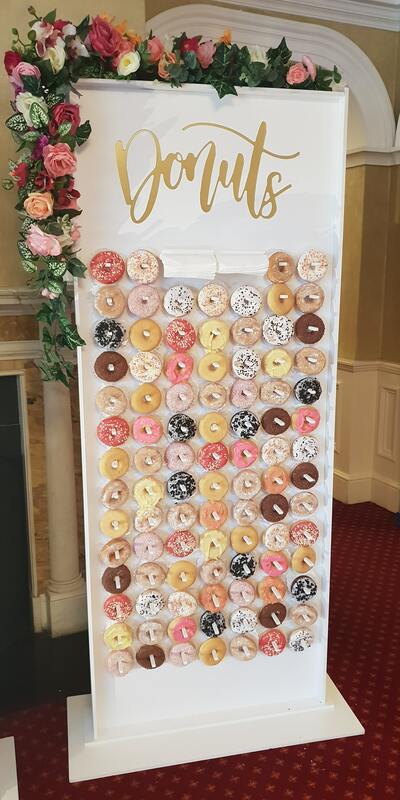 The wall is filled with a mixture of donuts including, Milke Chocolate, White Chocolate & Pink all covered with sprinkles alongside the seperate Donut stick holders and really adds a classy look to your event. Perfect for the wedding drinks reception and even better if a Chocolate Fountain was added for your guests to dip there donuts in. Nothing will wow your guests more then walking into a room and seeing a huge Donut wall. Chances are your friends and family will not have seen a Donut Wall before and it will become a talking point for years to come. 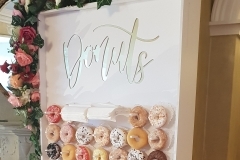 If you want some impressive wedding decor that is difficult to create and you do not want the hassle of doing so then this Donut wall is perfect for your event.